This week sees the return of Haute Couture, where designers preview their Spring/Summer elegance in Paris. I once read that there is no longer any profit to be made from Haute Couture and that for designers it's a chance to once again declare their relevance in the fashion world. The pieces are like works of art, bought usually by private clients and collectors after the ateliers have spent weeks bringing the designs to life. Whilst this may be so, I just love the Haute Couture shows-it's the dawn of something exciting in a relatively quiet month for fashion, it's a sign that fashion month is once again nearly upon us and it's so glamorous! J'adore!! Today was the turn of Chanel; you know I love a Chanel show! Before the video even airs on Chanel.com, I've been taking in the social media buzz that surrounded it. Set as always in the beautiful architecture of the Grand Palais, imagine the most beautiful minimalist garden. 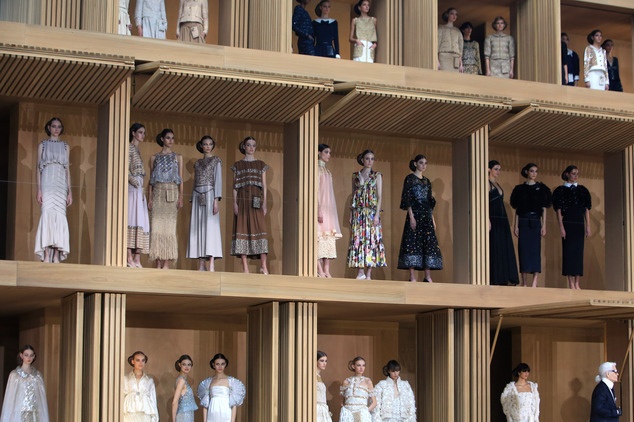 It's been preened to perfection lying in front of a plain wooden house, which in the finalé opens up like a doll's house to reveal all of the models standing beautifully inside. Models parade around the grounds, in their stunning Haute Couture gowns, which despite their elegance and detail seem incredibly wearable, thus channelling the spirit of Gabrielle Chanel. Curves, beading, intricate detailing, Princess Leia-esque hair which has been likened to croissants, only at Chanel! Models in boxes-the world's most fashionable eco house? My favourite looks from the show, were probably some of the most simplistic. I always wonder how Karl Lagerfeld and his team come up with such beautiful looks season after season; he can do no wrong! I love how opulent this coat is-the shape and the bow are exquisite! The blouse part of this ensemble-stunning! In awe of the shape and detailing! Kendall wears it best this time around! Chanel bridal? Beautiful detailing and tailoring...it's all in the detail, that's what's Haute! So there you have it, Chanel's SS16 in a nutshell! If, like me, you can't wait to see the show in full then make sure to keep checking Chanel.com for that all important upload; it'll be worth the wait! I loved the collection and can't wait for the Paris Prêt-a-Porter show in February! Hurry up fashion month, the world is waiting! Apart from the credit given to the Daily Mail, all images are copyright of Chanel.com-I do not own these images.